I lost 11 pounds this summer by giving up Mountain Dew. That’s right Mountain Dew. 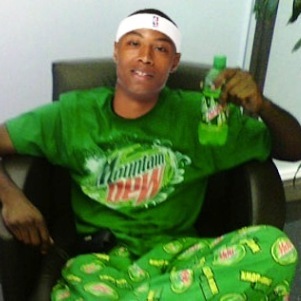 A lot of people don’t know I’m a Mountain Dew addict so I guess this is my confession. To try and give this up was crazy for me! I was going through withdrawals. I was in the bed sweating. My wife would turn over in the bed and ask “Are you OK?” Honestly, those first two weeks without The Dew [were] the roughest two weeks of my life. I’m talking headaches, sweats and everything. Before that I drank at least six 12-ounce Mountain Dews a day. It was so bad at one point that I had to have a cold one right there at the night stand before I went to bed. I had to get the coasters and let it drip a lil’ bit and just have it waiting on me. Come 2 a.m., I’d wake up out of my sleep, I’d pop one open and hear the fizz sound … and just down it! Then I always had to have another one in the morning when I woke up. Before practice I had one too and before games I would knock back two.